Did you know that Complex Post-Traumatic Stress Disorder (C-PTSD, or Complex PTSD) is not an official DSM V diagnosis? It is, however, a commonly used term in the field of counseling psychology. Many clinicians use this term, and are even able to recognize when someone falls into this category of experience. Complex PTSD is acknowledged by the US Department of Veterans Affairs, and its definition can be found in Wikipedia, and the International Society for Traumatic Stress Studies (www.istss.org). The US Department of Veterans Affairs readily identifies and acknowledges this experience of Complex PTSD as having additional symptoms beyond trauma or traditional PTSD. As stated above, Complex PTSD stems from a prolonged experience over time. When the body, mind and soul are living in a constant state of abuse, threat, or fear of some type, this chronic state begins to greatly impact one’s beliefs about oneself and the world. The human brain can become hyper-vigilant and hyper-protective. As a prolonged state, this impacts our development of neuro-pathways in the brain, the development of one’s body posture and gate as we walk through the world, the development of our trust in others, and finally, the development of trust in ourselves and our own judgments. In order to work through trauma, our body-minds need enough of a template of safety, calm and predictability in order to go into the triggering material and come out the other side feeling better. There needs to be a template of what it feels like to feel calm and relaxed without needing to be on guard for the next danger. 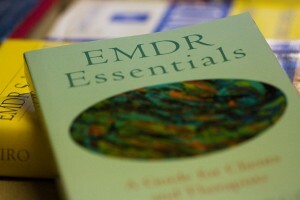 For people who have experienced prolonged experiences of physical, sexual, or even emotional danger, it can be challenging to do the basic EMDR Therapy protocol, because there is not enough experience of safety in the body-mind system to move through the stress and into a natural state of release or calm. For these individuals, the brain perceives that there is predictably another threat just around the next corner. In EMDR Therapy we begin with guiding the client to find a safe or calm place. So what do you do if your client has never had a place in the world where they could fully relax, because even if the particular place itself was relatively safe, their lives were not? The process of EMDR Therapy in this situation requires creativity, patience, and finesse. It requires the clinician to think outside of the box. It requires slowing down and building in the neural wiring of calm and safety before delving into and opening up what is disturbing. It requires knowing your clients learning and processing styles, being willing to experiment, and having advanced assessment and intervention skills to help keep people within their window of activation tolerance. We want clients to be able to integrate the work they are doing. In the Maiberger Institute’s EMDR Advanced Training, “EMDR Therapy Tools for Complex PTSD,” Barb Maiberger and I have developed a series of exercises to assist clients in finding a place of calm in their own body-minds when they are unable to identify a physical place in the universe that may be safe. Come join us and register for “EMDR Therapy Tools for Complex PTSD” if you would like to be inspired with new and creative ideas of how to create more safety for your clients, and thus peace in the world!